This is a picture of Kim, the day SPC Robert Hansen came home from his second deployment in Iraq with the Ohio Army National Guard. Give a very warm welcome to my special guest, Kim Hansen! Kim, I want to thank you and your husband for raising such a brave and caring son. Bob is graduating from Notre Dame College of Ohio this spring with a 3.5 GPA and a degree in Criminal Science. He is working towards becoming a US Marshall. Bob, thank you for making this world a better place. Here is what Kim had to say about her soldier. I will never forget that phone call as long as I live. 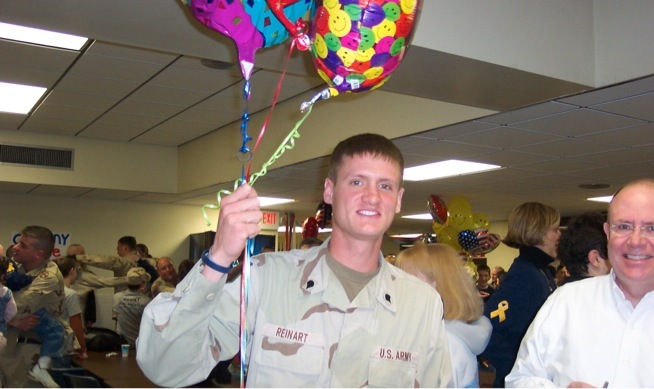 November 2003 is when I found out my 20 year old son had just gotten his orders from the Ohio Army National Guard – he was being deployed for 13 months to Iraq. They were leaving December 3rd for training and all I could think was, “Oh my God! We have so much to do in just a few short weeks.” My name is Kim Hansen and my son SPC Robert Hansen is a 2-tour war veteran of the Iraq Conflict. The first time he went overseas he was in Tikrit on an airbase and the communications were terrible. We would go weeks on end without hearing from him except for mail. I remember the first phone call – it came at 3 am and I thought I was dreaming that the phone was ringing. I picked it up and said hello and there was nothing. Then I heard his voice, “Mom?” I sat straight up in bed and must have screamed because everyone in the house was up after that. His 2nd tour was to Kuwait where he spent 12 agonizing months guarding the port. I remember people saying to me that I shouldn’t worry. The communications were better, but this war was taking its toll on not only the families, but the soldiers as well. His letters were always a comfort to get. Bob sent pictures home, so I could see his wonderful face and that gave me a little peace knowing that he wasn’t hurt or sick. I couldn’t watch the news. I just waited to hear from him on how things were going. He couldn’t say much because he had to be careful of what he said. Bob wanted to reassure me that I shouldn’t believe everything that I saw on the news. All these years later, I am still finding out things that happened over there. His homecoming the 2nd time was a much bigger relief. Bob wanted to surprise us and didn’t give us a time for his arrival. When I saw that big handsome man getting out of the car, I was overcome with a feeling of utter gratefulness. I ran to give him a hug, and I couldn’t let him go. 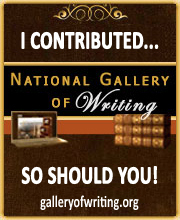 I knew that he was coming home to stay – no more deployments! Bob had served his country and now it was time for him to start his life. He gave 8 years to protect and serve. I was so thankful for the FRG (Family Readiness Group) that we belonged to both deployments. We supported each other while our soldiers were away – kept in contact on the computer and made some lasting friendships. My son turned into a man during this war and I am so grateful to God that he came home in one piece with all his original parts in working order. My heart goes out to the families of the soldiers that didn’t share that same fate. I have found great solace in keeping in touch with the people we have met along the way and watching them grow and prosper in their everyday lives. I hope that everyone thanks our soldiers for their service, because without them we wouldn’t be free today. The attack on 9/11 prompted my son to enlist in the Ohio Army National Guard. He said, “There is even more reason now than before.” Weeks before my son was to leave in December of 2003 for deployment to Iraq, my father, a WWII veteran, passed away. My son was part of the honor guard and handed my father’s flag to my mother. 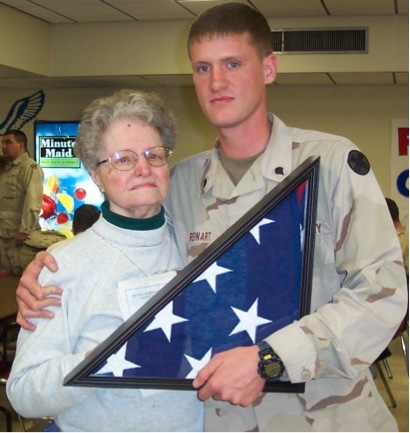 When my son returned from Iraq, my mother returned the favor and handed my son, my father’s flag. Whenever I see our country’s flag, my heart beats faster and my eyes fill with tears. My father’s flag connects me to my two veterans in my family. U. S. Veteran’s Day honors all of our veterans, who served past and present. God bless our troops and the country that we love. Take time to do something for a veteran for their faithful service. I will be saying thank you to my son by bringing him lunch at work. Just weeks later, Joe was leaving. My son, my father’s namesake, was being deployed to the Middle East to serve his country. . . We made it through his fifteen months of active duty and deployment. 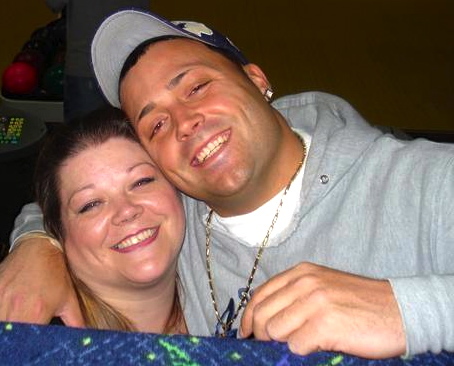 Joe’s homecoming was February 11, 2005, a wonderful Valentine’s Day present. In the crowded cafeteria at a school in Youngstown, teary eyed, my Mom presented Joe with my Father’s flag for his faithful service to our country. I relied on emails and phone calls to keep in touch,when my son, Joe was deployed. I loved this technology! 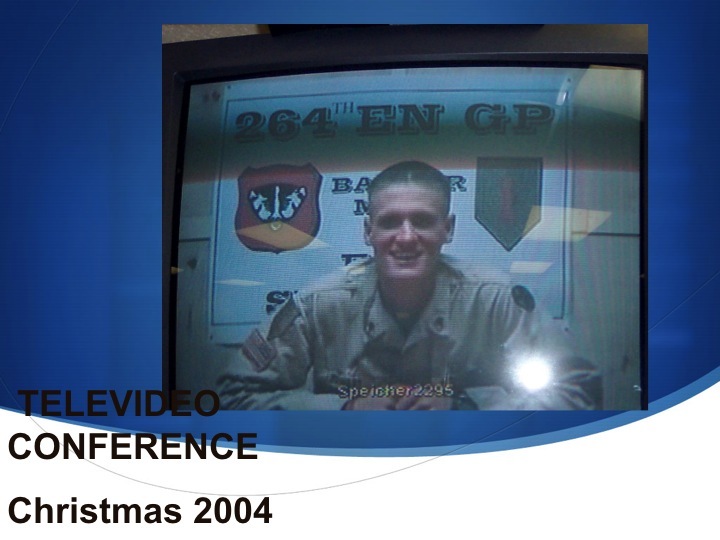 What was even better was seeing my son on a televideo conference just before Christmas. It was such a comfort to stay connected during that stressful time. Brian Albrecht from Cleveland.com tells how Ohio Army National Guardsman, Tim Sheaffer stays in touch with his wife, Amanda using Facebook. Tim deployed in June of 2011. Tim is due home this spring. Facebook is great, but coming face to face with his wife and new daughter will be the best thing of all. Please pray for Tim’s safe return and for all our troops and their families.